Shipping containers are used for transferring goods from one location to another location. Container locking cam is one of the important fittings of locking rod, which is mounted to the door of the shipping container. The locking rod includes a cam that can move between a first predetermined position where the cam can engage the cam keeper and a second predetermined position where the cam is disengaged from the cam keeper and can travel past the end frame of the shipping container and the cam keeper as the door travels into the volume of the shipping container. So, locking cam and cam keeper play a important role in the container locking system. Any damage of locking cam and cam keeper can cause a great loss of shipping goods. So, there is a high requirement on the quality of cam and cam keeper. When we evaluate all the metal forming processes, we can find that both the container cam and cam could be produced by forging and casting (see the difference between forging and casting…), but forging will always be the perferred manufacturing method. Why Forging for Container Locking Cam and Cam Keeper? Economically, forged cam and cam keeper are prevalent because of their inherent superior reliability, improved tolerance capabilities, and the higher production efficiency. In terms of quality, forged cam and cam keeper can achieve a better quality that is unexcelled by any other metalworking process. There are no interal gas pockets or voids that will cause unexpected failure under impact. So, forging can offer container cam and cam keeper in a faster production rates and lower costs. Same as door hinges, container locking cam and cam keeper are always needed for the new containers and repair. 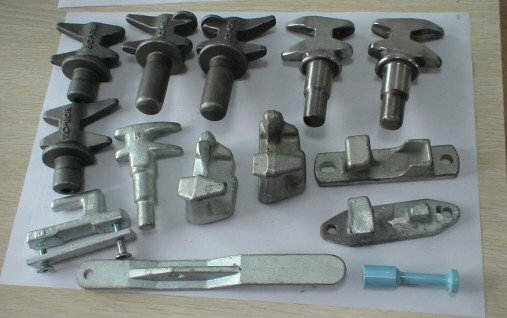 Fly Forge is the professional steel forging factory in China that can provide all types of locking cams and cam keepers as well as other forged container fittings (container door hinge, container lifting lugs, ect) in our advanced closed die forging technology. Any inquiry on container locking cam and cam keeper in forging, pls get in touch with us!